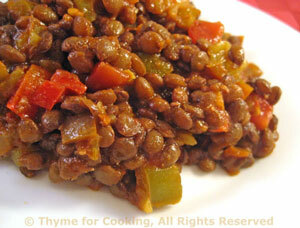 Savory Southwestern Lentils, Thyme for Cooking spicy side dish. I had something similar to this in a restaurant in San Antonio, Texas. I don't remember the name, and I never got the recipe. This is as close as I get to a return trip. Make them as hot as you like. I use the tiny, green lentils de Puy, but you can use the larger brown ones. Do not use the red ones, they get too mushy..
Cook the lentils in water and stock according to package directions until done. Drain if needed. When hot add chili powder and sauté for 1 minute, stirring constantly - this releases more flavors. Add onion, garlic and sauté a few minutes. Add red pepper, sauté another few minutes, then add tomatoes. Turn heat down to very low and sauté, uncovered, until all vegetables are very tender, stirring occasionally - about 15 minutes. Add lentils, drained chilis and stir to combine. Taste. This is where I stop but you may add more chili powder, chilies or hot sauce to taste. Cover and let simmer over low heat for 5 minutes to let flavors meld. Serve.